In Sin Slayers: The First Sin you take control of a band of heroes as they explore, complete quests and fight their way through a Limbo-esque place that exists between worlds. The place is called The Valley of the Fallen Sinners, and is a place where many once-great warriors who died because of their sins are doomed to wander endlessly for eternity – unless someone destroys the seven seals to the Portal of the Worlds. The current build of Sin Slayers: The First Sin contains a sizeable chunk of content with around 2-3 hours of gameplay. You start in an old church that acts as a base area where you can chat to NPCs, accept quests and build your squad, then you can set out into the surrounding area for some monster fighting fun. 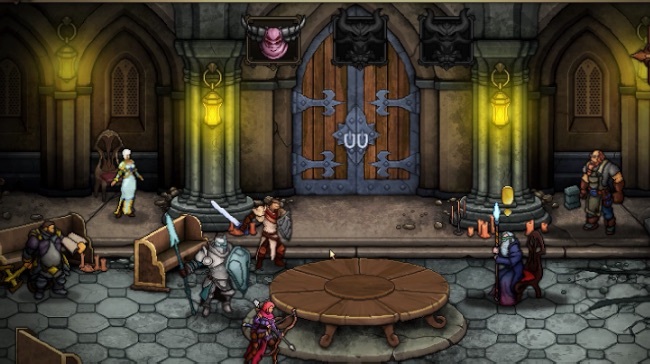 You explore the maps of dungeons tile-by-tile as in a traditional dungeon crawling roguelike. The majority of the time you won’t know what’s hiding on a new tile before you step onto it. Most tiles are empty, but you may also come across traps, random events, mini-quests or enemies. The choices you make during the random events will affect your Sin rating, which has an affect on how challenging your enemies will be. When you encounter enemies you switch to a side-on traditional JRPG viewpoint and face off in 3v3 (usually) turn-based battles. Some of the intricacies of the roguelike dungeon crawling can take a little time to figure out, but once you get to grips with it Sin Slayers: The First Sin is a very impressive game. The pixel art animation is excellent, the turn-based combat works well and there’s a nice amount of depth and randomness to the dungeon crawling. A heavenly helping of sinful dungeon crawling well worth delving into.